A few days ago I did a preview of HUE, a colourful and tiny little card game to be featured in the Pack O Games Kickstarter coming on August 4th from Chris Handy. HUE was very cool… but there are other tiny games in this collection… and they’re small! How small? So small, all five of my preview games can fit in my pocket – at the same time. Let’s do a quick run-through of them! Named after one of the most famous Mahals, TAJ is a set collection game where players assume the role of ancient rug collectors, and vote on proposals from other players to shift rugs in the play area, creating scoring opportunities. This is perhaps the trickiest of the Pack O Game that I’ve tried. First, all ten rugs are laid out under the Taj in a line. The Taj will cover three of them. Three will sit to the left, and four to the right. Players will each be given a “Yay/Nay” card with which to vote, and a personal hidden goal. The goal shows the three colours they are trying to score by getting rugs that contain those colours directly under the Taj. My goal in the picture above was to get orange, green, and yellow. With this information, players will take turns selecting two rugs to swap, and everyone will vote on whether to go forward with the swap or not. If no, the farthest rug from the Taj is removed. If a vote is unanimous, players can either move the Taj to the left or right or flip a card over, which can either speed up or slow down the end of the game. It’s a beautifully crafted game – perhaps my favourite in the collection, though I think it likely plays better with 3 or 4 players than it does with 2, simply because two players generally tend to defer to voting against one another. Named after a famous soup, FLY is perhaps the simplest of the games in the Pack O Game collection. It’s a dexterity game. You’re swatting flies! First, you shuffle the “table cards” and make a 9×3 grid with them. Then you’re supposed to put the “sky” card into the box and stand it up next to the board… this is the minimum drop height. You’re basically trying to collect sets of like-marked (or coloured) flies here. Sets will earn you more points… and more points = more win. As you swat flies (which means getting the swatter entirely over a fly, you need to consolidate the board by shifting cards up and to the left. It’s fun! It would certainly benefit from a felt table though. Playing this on a slippery surface is kinda painful. They’ll then use an action card, pinching overtop one of the four action selections (Uppercut, Head Block, Body Blow, Body Block). If your offensive action (Uppercut or Body Blow) wasn’t blocked, you get a point. If It was, the defender gets a point. If you both selected a defensive action, nobody gets points, and if you both select the same offensive action, both players get a point. It’s a tricky tightrope! Points are then accumulated on the corresponding point tracker on your boxer. The first to get any of those trackers to 5 points wins the the round. If you already won a round, you win the belt (and the game!). This is a clever little boxing game all about trying to anticipate your opponents selection. It’s a bit of a take on “Rock Paper Scissors”. Not having player other boxing games, I’m hard pressed to compare it… but I like how deliciously simple this one is. It would make a great travel game for two. GEM is a an auction game. Players are each given three coin cards and they will use these to bid on a gem card from a set. In order, players will bid an amount (zero is acceptable to start) and the next player needs to outbid, or pass. Players can then leverage their gem cards to help pay for bids they make on other gems up for auction, but doing so means they need to reinvest in them later to make them “active” and usable again. You’re always walking a tightrope, trying not to overextend yourself. In some ways, GEM reminds me of Splendor. Obviously there’s the thematic similarity, but you’re essentially doing the same things in both games. You’re using your coins to buy gems that allow you to buy more, bigger, awesomer gems. The different here is that you need to reinvest in those gems once you’ve used them. Outrageous! Not my favourite, since I’m not a huge auctions fan, but it works well with 2P, which is more than I can say for most auction games. We are the Misfits, our songs are better. …I’m happy to report that the Pack O Game is an excellent little package of games; a Kickstarter I would back in a heartbeat. A lot of thought went into each game, and it shows. Obviously the collection excels as a set of travel games. It’s perfectly aimed toward that market – even though the games play great when you aren’t travelling too! Handy has done a fine job of making the Pack O Game a diverse collection. It straddles a wide variety of mechanics and game types. You’ve got your dexterity game, your set collection game, your auction game. You’ve got everything! Not only does it tap into each of these categories… it does so really well. I’m excited to see what stretch goals Chris has up his sleeve; what other mechanisms and thematic attempts we might see. 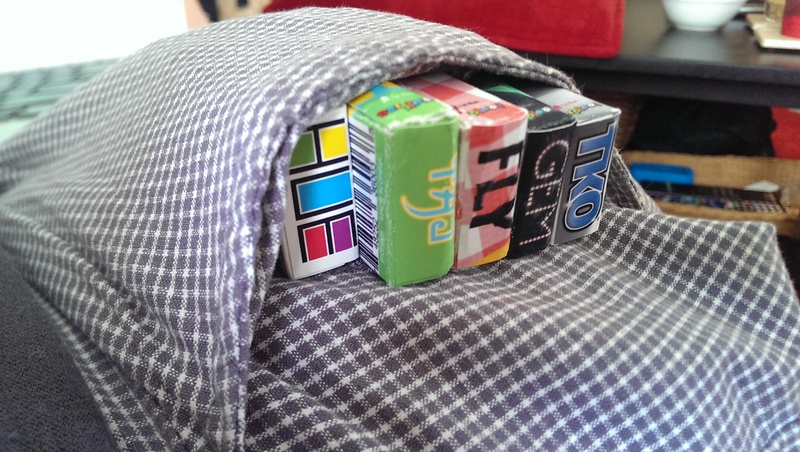 My biggest problem with even more Pack O Game is that I might eventually need a bigger Pocket O Holding to keep them all. lol, I love the fly swatters! All the art is brilliant, especially for such a small space (they look like mini Moo cards to me). The double coding on Taj is brilliant for anyone with colour issues. The use of rock-paper-scissors in TKO is simply perfect.